Yeyo Arts Collective is dedicated to the creative empowerment of women and families. We were founded by a group of black mothers and elder creatives who saw the need for space that supports the total family unit. We honor creatives and entrepreneurs of all ages and expertise. For four years we cooperatively operated a gallery in Locust Business District. In 2014 we moved to South City Saint Louis. During the formative years we enjoyed sister circles, Girls Create, a youth empowerment program and more. Through out the years we have expanded our programming to include Rediscovering the Black Arts Movement, Art Achievers, and Group-Centered Leadership. During the winter, we plan to bring all of our cultural richness and community programming to the Greater Ville Area. We will deepen our practice of relationship building and continue in a place-based practice. We were invited by our friends at ArtHouse, who like us, has individually and collectively been at apart of the creative and political renaissance of Saint Louis, for years. Through our collaboration, we plan to foster access to entrepreneurial support in an area where media deems to be "the most dangerous place in the United States. If you are interested in being a part of this major project please contact us at yeyoarts@gmail.com Third luck is a charm! With our third move, we are investing in an area we will call home. What do you know about Yeyo Arts Collective? Yeyo Arts Collective is dedicated to the creative empowerment of women and families. When we first began our group, we gathered out of the need to survive in our career path. As artists and creative professionals we had no center. We wanted a holistic and just place to begin our dreams. Limited access to a support network and resources, create barriers in artists lives. The need for economic stability in creative households is demanding. We identify all participants of our Programs as artists. We believe all people have the limitless potential to create, transform and rebuild. A strong self-awareness, place based history and knowledge of social conditions are tools given to create art, writing, business incubation, small group formation, with a deepening of historical knowledge and to make healthy, nonviolent decisions. Our long term goal is to support the development of artists, business owners, advocates and leaders in our Saint Louis neighborhoods and similar urban environments in the United States. Billboards, social media, and advocacy. Our short term goal is to support the advancement of leaders through access to support information, mentorship, wellness awareness and a cooperative business demonstration model, with professional development. Donations and fundraising efforts to support our next generation of leaders. Our weakness is that although our programs have created youth led projects, we have not yet created sustainable funding to accomplish a youth led campaign. We have yet to create a council of elders. We are still growing into our organizational consistency. People. We believe that our humanity needs support groups and professional networks without prejudice that are formed by the self-actualized inspiration of each individual. 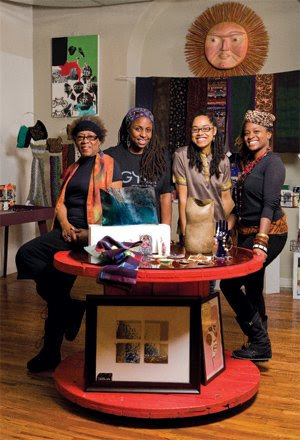 Yeyo Arts Collective formed during the process of opening Gya, a creative art space that was located at 2700 Locust. The gallery and fine craft shop opened in March of 2010 and the group became incorporated Feb 2011. The groups that encouraged the formation of this work were Organization for Black Struggle, Justice Institute, Literacy for Social Justice Teachers Research Group, The Cowry Collective and Nia Artist Collective. We are thankful for the strong support of established artists, patrons and organizations that are a part of the legacy of fine art in the city of Saint Louis. Priscilla Block, Roseann Weiss, Joan Suarez, Mary Ann Kramer and George Sams were guides in the early beginnings of our gallery venture. Yeyo Arts Collective is inspired by the term and arts movement coined “social sculpturing” by Joseph Beuys. Social sculpturing is a vehicle to transform society. The artist creates a social sculpture by exhibiting visual works based on their personal narrative, using creative writing as a form of documentation and participating in think-tank style social projects. Some of our longstanding collective members, supporting members and volunteers has shaped what the organization has been. Some members are with us for a brief time but there are many that has been on this journey with us throughout the eight years of our formation. The people mentioned were collective members for at least a year or collaborating or supporting members for three years or more. Jean Brantley, Dail Chambers, Andrea Hughes, Chinyere E. Oteh, Fannta Drummer, Valerie Wongoi Mayes, Tshepeso Matlapeng-Sani, Regina Martinez, Amanda Colon Smith, Ndea Collins-Whitfield, Jae Shephard, Erica Popp, William Chapman-Kramer, Dominique Purifoy, Waridi Valentine, Thomas Turner, Hero Harrell, Umeme Houston, Pacia Anderson, Darnell Chambers, Christopher Chable and Simiya Sudduth, all spent a year or more practicing a collective process with our organization. Andrea Richardson, Kris Robinson, Tasha Burton, Naado Ankrah, Ronnie Reese, Norman Ross, Treasure Williams, Siphne Sylve, Milton Holmes, David A.N. Jackson, Ennis Oneal Newman, Brittany Kellman , Danielle and Kevin McCoy, Deborah Mashibini, Chinaka Kizart, Shante Duncan, Curtis Royston, Jackie Masei, Cathryn Blue, Melissa Singleton, Sarah Paulsen, Ismima Nebkata and many others has been our community support network and key contacts for almost the entire duration of our organizational history. 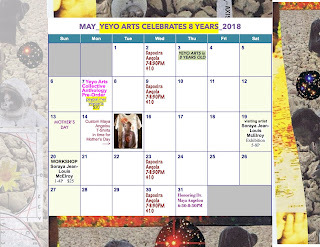 In 2014 Yeyo Arts Collective focused its mission and relocated to 2907 S. Jefferson Ave. The location offers stronnger access to the public. It is on a major street and has a bus stop in front of the community gallery and office location. It is in close area to Cherokee Street and in the Benton Park West neighborhood. Yeyo Arts Collective Presents rotating classes and workshops offered by our own collective members, as well as collaborating organizations and guest artists. In Art Achievers Summer Art program, young citizens the age of 7- 15 years of age will create art, develop leadership skills and celebrate famous Black Missourians for their works of achievement. Yeyo Arts Collective provides a community support network for creative people. We offer mentorship, youth entrepreneurship opportunities, resource material and contacts and more. Our gallery location is a launching pad for craft artists and community organizers. We maintain a unique library. In the past, we maintained a public check out system. Currently, the collection is available by request. We are working towards an online system. Topics include Ancient Art, Self Help, Sustainable Living, African Art, Black Feminism and more. We also have a small zine library, which includes zines made by the collective and collective members. Collective Action, as catalysts for economic and cultural achievement. Participants will share techniques, skills, and information during this three-day convening. We hold bi annual gatherings in a conference style since 2014. Past presenters include Skylah Hearn, Luisah Teish, MB Dance, Jessica Gordon Nembhart and local organizations. We take a 3 day look at professional art practice, cultural support and transformative action! We look forward to seeing folks who practice community based art, working in the disciplines of creative writing, dance, storytelling, visual and multi discipline. We look forward to seeing people of color and anti-racist allies who are professionals in their field. Artists, creatives and legacy keepers will share their experiences through dance, storytelling and workshops, tours, exhibitions and more! To serve a group or community is to develop oneself and support the leadership in others. Through art, one steps into a leadership role merely by creating the object, image or experience for the public. Group Centered Leadership in the Arts is a project designed by Saint Louis, Missouri based artist Dail Chambers to address the need for viable entrepreneurial models in underrepresented communities. In collaboration with Yeyo Arts Collective, a spectrum of art workshops, socio economic trainings and cooperative business model experiences will guide the participating community through an actualized individual project while harmoniously supporting the mission of Yeyo Arts Collective. Artists present their work, and build their individual thought processes about their practice or project. The group is introduced as a support network. Rediscovering the Black Arts Movement is a look at the influence of a national, cultural and political movement in Saint Louis and the artists of the area. A long list of collaborations and successes has been achieved by members of the group. Through regular workshop and lecture series we take a look at the Black Arts Movement, The Black Arts Movement in Saint Louis and key individuals who played a part in the culture of Saint Louis. Our lectures and workshops include storytelling about Laclede’s Landing, popular media, and the life of Maya Angelou, Mary Meachum and Annie Malone. We love learning from the Black Arts Group, also known as “BAG.” The legendary formation inspired the world, during their group’s history. We also take a look at the historic areas of once thriving African American and arts community, Mill Creek Valley Laclede’s Landing, and parts of North Saint Louis. The highlighted areas are focus areas for many past creative and historical accomplishments in the African American community. We were intentional with our first gallery endeavor with place-based honoring. We were located three blocks from the Scott Joplin House, the childhood home of a visionary ragtime musician and composer. We were located down the street from the Black Artist Group, a legendary collective of musicians, writers and artists’ past location. We were across the street from the first black YWCA west of the Mississippi river, the Phyllis Wheatley YWCA. We were diagonally west of the childhood home of Tennessee Williams. We were walking, creating and joining in a creative hotbed. It is in the middle of the nation and on longstanding historic ground. At our South Saint Louis location we are five minutes from the childhood home of Maya Angelou. We are tucked away in the midst of large street traffic, yet safely across from a firestation. Each place has a deep history that we are learning from as we do our work in the places. Our organization supports the keeping of ancestry, ethnographic research and libraries and archives. We communicate about our personal and collective ancestry stories and origin myths in our art and organizational practice. We highlight legacy keepers and honor the local elders who support our organizational growth through awards, formalized thank you and support of their art. In GirlsCreate young creative children between the ages of 7 and 14 create and explore the world together through art and healthy living practices. During 2010-2011 the program ran as a weekly meet up. Throughout the years it has been rotated to special interest groups and unique program opportunities. The young creatives has created photo journalism projects, worked on farms and gardens, created a youth led book club and more. Each Saturday in July 2011 we created lively window boards for vacant homes and places in North St. Louis and beyond! Artists Andrea Hughes led workshops. GirlsCreate is a program sponsored by YeyoArts Collective members and is created and facilitated by artist and organizer Dail Chambers and community educator and organizer Chinyere E. Oteh. Both teaching artists are graduates of the Regional Arts Commission's Community Arts Training Fellowship. The Yeyo Arts Gallery has relocated to 2907 S. Jefferson Ave. St. Louis, MO. We moved to our new South City location in 2014. We were previously known as Gya Community Gallery located at 2700 Locust Ave. St. Louis, MO. We host fine art exhibitions in our gallery on the topic of women, youth, family and community. Each featured exhibition includes a discussion and/or reception. 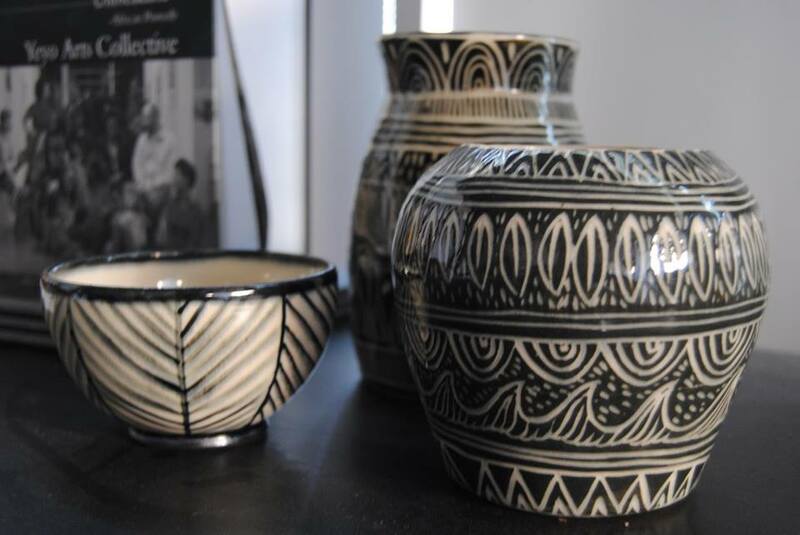 In our gallery we feature special groups, legacy artists, textile art, and emerging artists. Our gallery has maintained exhibitions for eight years and has an extensive list of past artists represented. to veteran focused special interest groups, we are linking the creativity of veteran families with resource and personal development. We host regular cultural, family friendly events! From poetry readings, to film screenings, we connect to the community through our events. Our holistic approach to creative empowerment allows us to navigate topics of self-care such as sustainability and creative living solutions, gardening, combating environmental issues through the arts, and combining healing modalities with practical art making. Our programming supports the mental health of individuals and groups living in urban environments and have been affected by PTSD, Depression, and more. Does your organization have a creative, fun idea? There are a few ways to work with us. Workshops and Classes! Are you a yoga instructor with a small following? Do you teach self-esteem or a craft? Host your workshop at our space and we will assist you with enrollment! We just ask that you donate 30% of the fees back to the collective! -Looking to rent a space? Do you already have a clear plan of what you want your event to be? Would you like to host a private event in our intimate space? Contact us for space rental details. -Volunteer! We operate without a paid staff. Volunteering in a great environment, with diverse opportunities and a clear goal. -Intern! Please contact us for an experience that is unique, creative, and understanding. We accept interns on a rolling basis from a variety of disciplines. We are using our process of development and organizing as the foundation for two curriculums. Our Teaching Artist Guide created with North Saint Louis Arts Council serves as a basis for our youth programming. Our Group Centered Leadership in the Arts Curriculum serves as a process for our adult and creative entrepreneurial programming. Our organization has facilitated sessions in conferences, gatherings and academic settings around the country. We attempt to co-facilitate as much as possible with two active members from our organization. Yeyo Arts Collective has had an exhibiting presence in Pittsburgh since 2012. Our group is a mentor and collaborating organization with the Flowerhouse, a Pittsburgh based community arts space. Yeyo Arts Collective has built relationships in New Orleans since 2010. 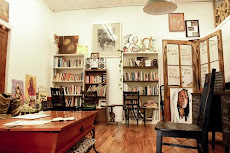 The organization exhibited at the Gris Gris Lab, Blackstar Books and Caffe and members participated in Urban Bush Women. The organization has been awarded funds from The New Orleans Jazz and Heritage Foundation and has collaborated on projects with NOLA Herb Gathering and Sista Midwife Productions. An anchor relationship is with Community Book Center. Through partnerships with Caritas Village, Frank D. Robinson and Artistik Approach, Yeyo Arts Collective has had an exhibiting presence in Memphis, Tennessee since 2010. Our research development and exhibition partnerships happens regularly in Chicago, Ill. We have exhibited and co-shared space at Urban Art Retreat on numerous occasion. We attended the Ella Baker Institute at University of Illinois Chicago. Our collective members exhibited in Bronzeville, at South Side Community Arts Center and pop up exhibitions throughout the duration of our organizational history. Gya community art gallery opened. Programming increases to include cultural events. Collaboration with North Saint Louis Arts Council as a paid youth arts program including photography, murals and mosaic. Discovering the Black Arts Movement programming. Published “Sticks in a Bundle are Unbreakable” our first collective literature. Rediscovering the Black Arts Movement programming. Yeyo Arts Collective works with Saint Louis City Parks and Recreation for Summer Camps through Art Achievers Programming. “We are Yeyo” campaign launched. Two collective members travel to Tanzania. Art Achievers program is continued. Flowerhouse in Pittsburgh, PA is formed as a collective. We are excited to highlight our 2018 International Artist in Residence. Ife Olatunji is an artist, anthropologist and ethnographic documentarian who created Collected Voices Ethnographic Film Fest. She has received numerous awards anf fellowships for her work. As an anthropologist and documentary filmmaker, I have always been interested in the non-tangible aspects of culture, such as love, faith, and spirits. My project in Nigeria, entitled "Footing" is about the spirit that remains after 400 years of physical change. Over the course of a few weeks, I hope to document the daily lives of women and girls as they learn about and practice traditional African faiths in the heart of Nigeria, Ile-Ife. Through photography and cinema verite vignettes, I hope to be able to capture the spirit of my ancestors stolen hundreds of years ago. I look forward to gallery viewings and discussions between Nigeria and America. Group Centered Leadership in The Arts is now enrolling! Join us for a journey of manifestation. In our first mini residency 90% of the participants completed their goals and lived their wildest dream! Artists traveled to Tanzania, India, and through out the country with their creative talents. Professional CD's and large bodies of works were released into the world. We began our journey with self care. In the next series we will deepen our practice. We want you to join us. Apply today. More info below. Please read the attachment! Group Centered Leadership in the Arts supports artists in achieving their economic goals in an inclusive environment. Group Centered Leadership is an organizing model that encourages individual growth and empowerment as a way to affect positive social change. Small group art projects cultivate leadership development. Artists will create a culminating project in response to their experience. Participants are asked to: Present their creative vision, participate in workshop schedule, and create a culminating art project. In Group Centered Leadership in the Arts individuals achieve their creative goal while simultaneously achieving common goals that support positive social change. 4 workshops at Yeyo Arts every other Sunday. Please send in your letter of interest ASAP! The fee for the mini residency is 65.00 and covers the cost of communal supplies, welcome packets and culminating event. Please read attached flyer. We are excited to announce a rare mini- residency to Soraya! She is a life long artist with a plethora of creative magic in store for the Saint Louis area. *This mini- residency is in conjunction with the month long celebration of Yeyo Arts Collective's 8 year anniversary! Soraya Jean­-Louis McElroy is a Haitian born, Harlem and Brooklyn raised mixed media queer womynist artist conjurer and healer currently living and loving in New Orleans. Her love of black wom*n and families, motherhood, nature, wildcrafting, Black Feminist Futurisms, comics/graphic novels and the African Diaspora are central themes in her work. Soraya’s work as an organizer, mentor, counselor, doula and medical anthropologist focusing on women’s health and African folklore strengthen her commitment to resisting oppression and facilitating healing through imaginative creative/art activism. Soraya has participated in several group exhibits in various New Orleans cultural institutions including the Mckenna Museum of African American Art, The JuJu Bag, Antenna Gallery, The Jazz and Heritage Gallery and a solo show at Café Rose NiCaud and Backatown Coffee Parlour. Her works have been used in zines, books and promotional materials such as M Archive : After The End Of The World by Dr. Alexis Pauline Gumbs, Secret Rivers : Domestic Violence Zine, Near Kin: A collection of Words and Art Inspired by Octavia Estelle Butler, and the Official poster for Audre Lorde Days at Tulane. She also served as make-up and costume designer for Monica McIntyre’s album It Soon Come and recent creative altar designer for the re-branding of SpiritWerks : Music and Reiki Facilitation by Spirit McIntyre. Soraya is the co-founder of Wildseeds: New Orleans Octavia Butler Emergent Strategy Collective. Wildseeds work, steeped in Black feminist traditions of survival and healing, engages Octavia Butler and other speculative/sci-fi and fantastical authors a resource for social change She is currently working with various community organizations, sharing her skills as a dedicated and seasoned teaching artist and facilitating her own series of creative playshops while enjoying her beautiful family. Soraya is constantly imagining and creating new work and was awarded the Alternate Roots Visual Scholars grant in 2014. Most recently, Soraya was the creative facilitator, curator and contributing artist for one of the largest public art exhibitions in New Orleans, Wildseeds “Sacred Space”at ExhibitBE and co-organizer of the inaugural Black Futures Fest: A Celebration of the Black Fantastic in New Orleans in 2015.